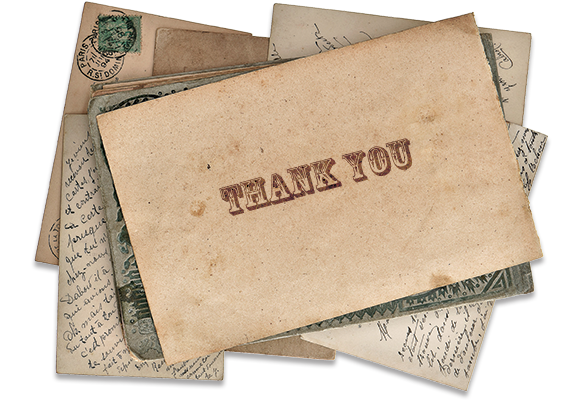 We would like to thank all our amazing guests for their kindness and patronage. We appreciate all our customers and the feedback we receive from them. We are constantly working to improve the quality of our services, and feel accomplished when our guests enjoy their stay with us. Click on the image to the right to read some testimonials and reviews. Welcome to The Cow Palace Inn! We’re happy to have you on our website and invite you to take a tour of our fine establishment. We’ve been working hard to remodel, renovate and repair this historic hotel, and welcome your visit. Click on the Photo, Video or Panorama buttons to change the presentation. Welcome to the one and only Cow Palace Inn! The Cow Palace Inn has been a landmark hotel of Lamar, Colorado since 1972. It has mounds of tradition, a number of eating establishments; for breakfast, lunch and dinner; as well as all the amenities of your traditional hotel establishment. We’re a proud partner of Rodeway Inn and look forward to your stay with us. Allow us to host your next event! 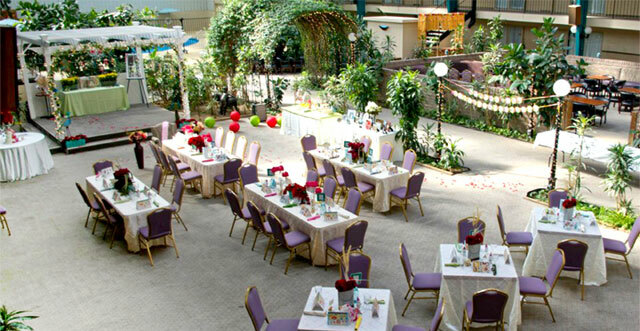 We have a variety of conference rooms to use, as well as an immense indoor atrium for business meetings, luncheons, birthdays, weddings, dances and just about anything you can imagine. After a long day on the trail, there’s nothing like sitting down to a hot meal. Join us for dinner, lunch and/or breakfast in one of our fine eating establishments. Whether it be Clementine’s, The Corrall Grill, The Branding Iron Saloon or The Ice Cream Palace; you’re sure to find what you’re looking for. Welcome to the official web site of “The Cow Palace Inn,” a landmark hotel of Lamar, Colorado since 1972. It has mounds of tradition, a number of eating establishments; for breakfast, lunch and dinner; as well as all the amenities of your traditional hotel establishment. We’re a proud partner of Rodeway Inn and look forward to your stay with us. 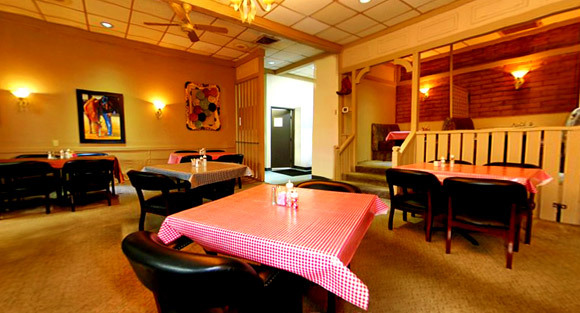 The Rodeway Inn Cow Palace has the space you need with approximately 100 rooms available to rent. Boasting a an assortment of amenities, we’re able to cater to the needs of individual travelers or large groups. These include three restaurants, a lounge, meeting rooms, a large banquet room, a swimming pool, hot tub and wireless Internet. Thud providing for those planning dinners, birthday parties, meetings, weddings, and special functions including Christmas parties. The Rodeway Inn Cow Palace is located at 1301 N Main Street in Lamar. Please call for additional information at 719-336-7753, or, fax 719-336-9598. We don't want to brag, but we've won an award or two for our services. Click on the link below to learn more. We've worked hard to make our eating establishments the best in town. Come and see why we've earned the people's choice award for best steaks, atmosphere and waitress! 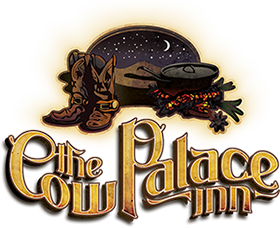 Ever since it's establishment in 1972, The Cow Palace Inn has been a premier establishment for hosting a variety of events, conventions and good ol' times. Need a place to stay in Lamar, Colorado. Look no further. We have some great rooms available for all travelers. Use the link below to reserve a room through the Rodeway Inn online reservation system. 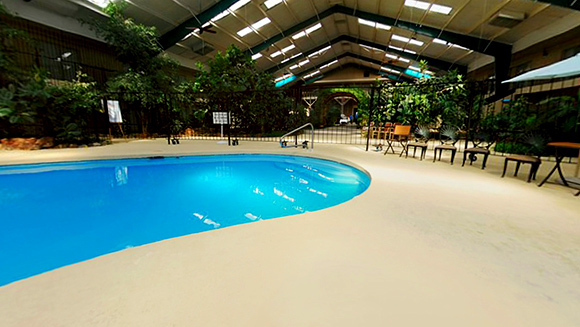 Enjoy relaxing in the indoor heated pool, accessible year-round in our climate-controlled, indoor atrium. There's plenty of deck space and chairs for lounging as well. Our family was traveling cross country and stumbled upon Lamar CO, which in itself is a pretty small town. We were attracted to the Cow Palace Inn by it’s great lighting. (It was dark) The parking lot was well lit and quite large. The lobby was a throwback the the old west which was very classy and well thought out. I loved that the theme was throughout the common areas. We were all starving and couldn’t wait to eat. We were seated in the restaurant and waited on quickly. We LOVED the salsa!! (I know my salsa and this is homemade) I thought they would ask us to please stop asking for more, but the salsa is bottomless for sure. We all ordered something different on the menu and it was all cooked to perfection and absolutely delicious!! Last but certainly not least, when we were leaving we had the great pleasure of meeting the owners of the hotel, Doug and Lee, they personally thanked us for staying and asked us if there was anything else they could do for us to make our stay any better. We said no and thanked them again. Doug asked if we had tried the ice cream parlor and we said that we had not. He showed us where it was and we all enjoyed the BEST ice cream we have ever had! Would I return to the Cow Palace? 100%, no question!! Great name for a place in Lamar, Colorado. The beds were really nice, and so were the rooms. Big TV, and kind of unique inner part of the hotel with the pool and huge area it was in. Has a lounge, and restaurant too. Would recommend. My family and I stayed at the cow palace and had a good experience. With young kids the heated pool was a big plus! Having a restaurant on site made it convenient. The service at the front desk was helpful. We will definitely stay again when passing through Lamar. I grew up in Southeastern Colorado and my parents still live there. Recently my Mom celebrated her 90th Birthday and I made sure my family and all of my grow children and spouses we able to be there. Because of the number of us, I booked us all into The Cow Palace Inn in Lamar, Colorado. It was a great experience in small town USA from the time we checked in to the time we checked out three days later. The front office staff was very courteous and accomodating and we were set up with three adjoining rooms. They were all clean, spacious and comfortable. The free breakfast was a real country breakfast not just a muffin and coffee. The wait staff was very professional and service was excellent. If you are looking for a beer at the end of the day try the “Man Beer” in the lounge and you will not be dissapointed. My five year old grandson loved the indoor pool. So if you are passing through Southeastern Colorado and want a great place to stay with friendly people and atmosphere The Cow Palace Inn is a great choice. This place just keeps getting better everytime we stay. The room was clean. the beds were soooo comfortable. The courtyard is so wonderful with the tropical plants. The staff is so friendly and kind. It was great. The Owner, management and staff are to be commended on what they have done to this hotel. It just keeps getting better since the new ownership took over a few years ago. I am from Denver, Co and all of my children, grandchildren and other family members live in Lamar,Co. I stay at the Cow Palace Inn every time I go to Lamar. Each time I go it seems like they have improved with what they have to offer. They have the restaurant, bar, Latte bar and Ice Cream Parlor all in the same place so I don’t have to venture out very far. They have a pool and hot tub so I just invite the kiddos and the fun begins. Very convenient for what I need. I have to compliment the staff for their kind hospitality. They make you fell right at home. So thanks to Doug Thrall and his partners and staff for a job well done. Nice clean rooms reasonably priced. The only reason there were not 5’s all the way down was that the air in our room really never did cool down the room & it was turned down as low as it would go. We did not complain because we thought it would eventually cool down & just didn’t want to mess with moving our stuff, but I am sure if we had we would have been moved. The air worked perfectly in the room of our other family members next door. The front desk girls were very friendly and made us feel welcome. The place was clean & had a restaurant on site as well as a small sports bar area and an area where you could get ice cream or speciality coffees. There is no free breakfast but you do get discount off coupons for each guest that can be used in their restaurant. They offered a buffet or you could order from the menu which we did. You won’t be disappointed by the breakfast, each one was huge and not only delicious but i don’t think any were over $10 before using your coupon of $3. There was a nice indoor pool with plants to make it have a little of a tropical feel however we did not have time to enjoy it. If ever in the area again we would make sure to stay here. Worth the stop has everything you want. Very nice restaurant, they have a new coffee and ice cream parlor, nice club area and the rooms area comfortable . and Friday nights is their Mexican buffet night – yummy. This hotel is not a five star affair, but it is a reasonably priced hotel with a nice bar and restaurant and a great indoor pool, hot tub and garden area. Sherry, our front desk clerk helped us solve a minor problem with our room, and made sure we were getting the lowest rate (even lower than originally booked on the corporate website). She put us in a room adjacent to the pool. We would definitely stay there again. It may not seem possible, but there is a lot to see and do in and around Lamar, expecially for history buffs. My husband and I took a cross country road trip recently and stayed in several different hotels…this is the only review I felt compelled to write. When I googled hotels near our current location Cow Palace Inn was an option. I programmed the GPS and we headed that way. I read some of the reviews for the Palace and I must say, I wasn’t expecting much. BOY, WAS I WRONG!!!!! Or should I say, these negative reviews are WAY OFF!!! On our way there, we did smell the packing plant…It was pretty gross, but what would I expect being in cow country? I didn’t get even a whiff once we were there. They had ample parking, lots of lights, and it felt very secure. (some hotels went to, I worried about our safety) We were greeted by two very nice young ladies at the front desk who were very helpful. I asked about the kitchen being open and they said “we usually close at eight, but we can take care of you.” It was 5 minutes or less to close and they served us anyway. 🙂 I have to say that the food prepared by the chef is honestly some of the best food we have ever eaten. Not one ingredient was out of a can or frozen!! I couldn’t believe it! We were beyond satisfied with our meals, the ambiance was cozy and our server was great!! Well, I could go on and on…. I didn’t mention the ice cream parlor (creamiest ice cream I have ever tasted!!) or the bar or all of the cool history on the walls, but I did feel I owed it to the staff of the Palace to write a truthful review. I have no idea where the people with negative reviews stayed, but it wasn’t at the Cow Palace we stayed in, that’s for sure!!! !